Northern Frontier has now decamped to JUBILEE; Marsabit, Isiolo, Wajir, Mandera and Garissa. Coast- one of the strongest zones has burst due to juvenile tactics of ‘Sultan’ Joho- who started behaving like a small king the moment he started funding Raila. Jubilee and NASA are going to share votes equally at the Coast, that is if Jubilee will not beat them..
Kalonzo has gone with all his Ukambani votes, after being cheated in 2013 in MoU- that Raila will step down in 2017. Luo Nyanza is facing unprecedented apathy- no one is even campaigning since they know that ODM tickets are sold to highest bidder. Luhyas did not even register as voters- so in spite of being the second largest community- as far as voter numbers are concerned- they are number five. With all these facts staring at them…. you will get some Raila supporters saying “We will not accept rigging”. Explain to me…. how do you even start fighting something that is self cannibalizing? How? NAIROBI, 19 March 2017 (PSCU) – After a two-hour bumpy chopper flight from Nairobi, President Uhuru Kenyatta on Saturday landed at the dusty Dhobley Military Camp in Somalia to be greeted with military honours. The Commander-in-Chief, making a surprise visit, was in Dhobley to lift the morale of Kenya Defence Forces, as well as encourage them with the message that their country stood with them and appreciated their sacrifices in securing Kenya. President Kenyatta – in full military regalia – arrived at the camp located in the dusty town of South Western lower Juba region of Somalia shortly after midday on his first visit to the warzone in the context of lifting morale of Kenyan troops. 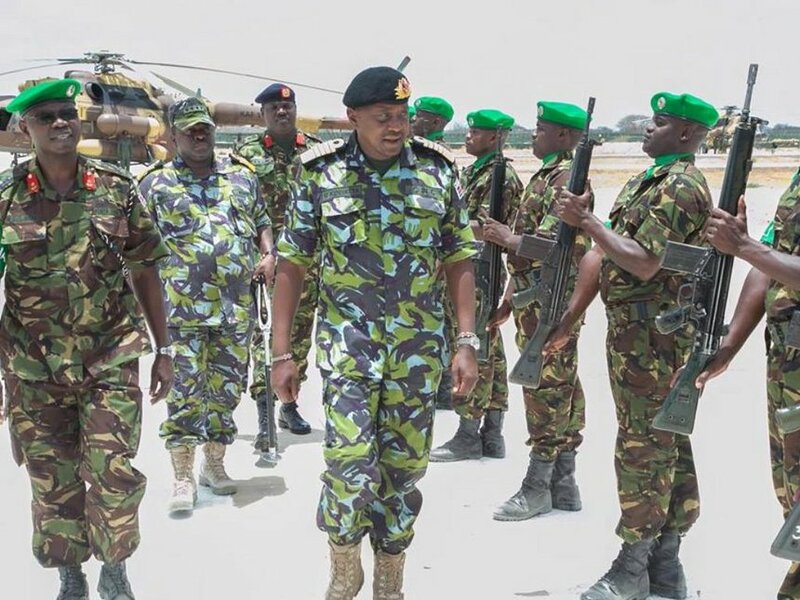 Chief of Defence Forces Gen. Samson Mwathethe and Sector Commander Brigadier William Shume were at hand to receive the President as he disembarked from the military chopper that carried him, and a tiny group of aides. “Welcome to Dhobley, it is a bit hot but please bear with it Your Excellency,” Gen. Mwathethe said as he welcomed President Kenyatta on his first visit to the camp. The Dhobley Military Camp – located 20 kilometres from the town of Liboi in Kenya – also serves as the headquarters of the AMISOM, a nerve centre and a log base for the UN in Somalia. With troops-in-line, a military honour akin to an honour guard, the Commander-in-Chief was ushered into the camp where he signed a visitor’s book before he planted a tree signifying his visit to the battlefront. The relative calm of Dhobley town was disturbed by heavy gunfire as soldiers demonstrated to the President how they fight the enemy. Not even the scotching over 40 degrees centigrade sun and dust could discourage the President from touring the camp to examine the equipment used by the troops in the battlefield. 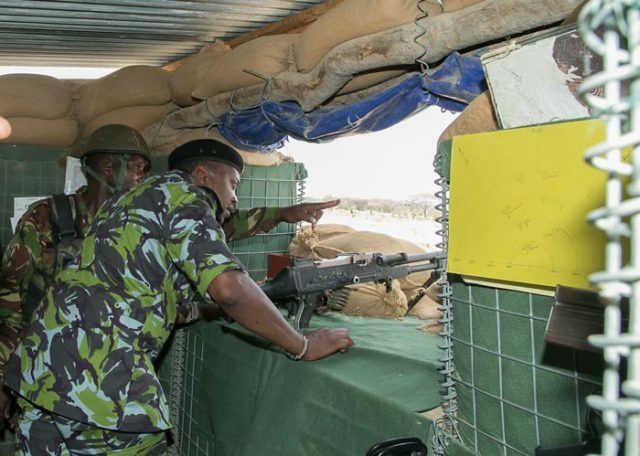 The Commander-in-Chief, who was conducted on the tour by Gen. Mwathethe and Brigadier Shume, ventured into bunkers to inspect their set-up and rode in a combat vehicle as he witnessed first-hand how the troops were working to secure the country. After the tour, the visibly impressed President Kenyatta addressed the troops and commended them for their sacrifice and service to the nation. He assured them that majority of Kenyans were proud and appreciated their work. “Please keep your spirit high and keep your morale even higher knowing well that we appreciate what you are doing for the country,” President Kenyatta said. President Kenyatta also visited a field health facility located at the camp and wished quick recovery to a soldier admitted at the facility. The visit to Dhobley camp by President Kenyatta was received by the troops as a special gesture that uplifted their spirit and patriotism, and served to underscore the importance the President attaches to the restoration of normalcy in Somalia. The visit came barely a day after the Head of State deployed KDF to the counties of Baringo, Elgeyo Marakwet, Pokot and Laikipia to beef up security in the troubled areas – an additional task the military have embraced with gusto. Gen. Mwathethe thanked President Kenyatta, saying there was no better way for a Head of State to motivate soldiers than to spend time with them at the battlefront. Despite criticism from some Kenyan politicians, Gen. Mwathethe said the KDF presence in Somalia has diffused a lot of attacks from the enemy. “We are working here because we love our country. And that is why we are devoted to protecting the lives of fellow Kenyans,” Gen. Mwathethe said. He said the President’s visit to Dhobley has equipped the Commander-in-Chief with first-hand experience on what the troops are doing to secure the country. President Kenyatta spent over three hours at the camp where he had a sumptuous meal with the overjoyed soldiers who share with him their individual experiences at the warzone. “Hip-hip hooray, hip-hip hooray, hip-hip hooray,” the Kenyan troops cheered their Commander-in-Chief as he wrapped up his surprise visit to the camp in the South Western lower Juba region of the war-ravaged Somalia.